Green People Nurture Body Lotion is a nourishing organic hand and body lotion to feed thirsty skin. A nutritive moisturiser free from alcohol to soothe chapped hands and dry skin. The Nurture Body Lotion is made with organic perilla, aloe vera, evening primrose, squalane from olive, shea butter and bergamot. Suitable for those who may be prone to skin conditions such as eczema and psoriasis. Nourishing, alcohol-free and non-greasy lotion for super soft skin. Soothing and moisture boosting to promote elasticity for dry skin. Squalane from Olive and Jojoba esters rehydrate and rebalance. Perilla oil and Evening Primrose are rich in Omega fatty acids to soothe sensitive skin. Enriched with a beautiful exotic scent of Bergamot, Ylang Ylang and Mandarin. Green People’s natural and organic Nurture Body Lotion is made without sodium lauryl sulfate (SLS), sodium laureth sulfate (SLES), parabens, lanolin, phthalates, propylene glycol, alcohol (ethyl alcohol, ethanol), harsh foaming agents, irritating emulsifiers, synthetic fragrances, PABA-sunscreen, gluten, colourants, petrochemicals, urea, DEA, TEA or PEGs to bring you the purest organic body lotion that nature can offer. Aqua, Butyrospermum Parkii Butter*^, Helianthus Annuus Seed Oil*, Glycerin*, Olea Europaea Fruit Oil*, Squalane, Cetyl Alcohol, Cetearyl Glucoside, Cetearyl Alcohol, Perilla Frutescens Seed Oil*, Elaeis Guineensis Oil*^, Simmondsia Chinensis Seed Oil*, Glyceryl Stearate, Aloe Barbadensis Leaf Juice Powder*, Oenothera Biennis Seed Oil*, Althaea Officinalis Root Extract*, Rosmarinus Officinalis Leaf Extract*, Chamomilla Recutita Flower Extract*, Aroma (Citrus Aurantium Bergamia Fruit Oil*^, Pelargonium Graveolens Oil*^, Citrus Nobilis Peel Oil*, Cananga Odorata Flower Oil*^), Hydrolysed Jojoba Esters, Sodium Lauryl Glucose Carboxylate, Lauryl Glucoside, Sodium Stearoyl Glutamate, Benzyl Alcohol, Salicylic Acid, Sorbic Acid, Benzyl Salicylate*, Benzyl Benzoate*, Farnesol*, Limonene*, Linalool*, Geraniol*, Citronellol*. 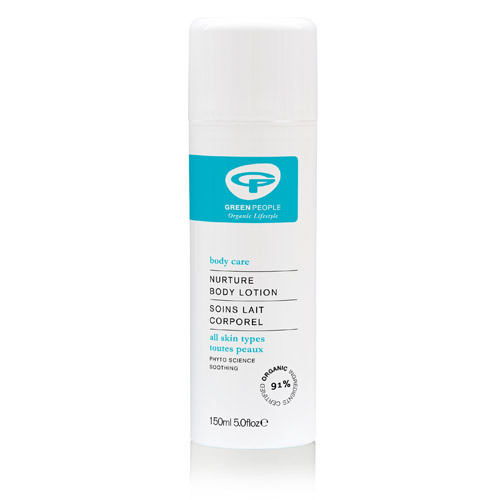 Keep hands and body soft and moisturised - for dry, irritated skin. Use as often as required. Below are reviews of Green People Nurture Body Lotion - 150ml by bodykind customers. If you have tried this product we'd love to hear what you think so please leave a review.